RealChoice: Two Safe and Legal Deaths: Would More Die if Not For Legalization? 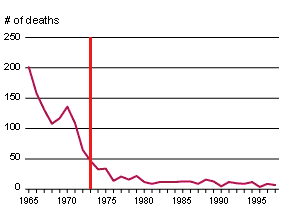 If you look at death rates, not just total deaths, you will see that abortions have gotten a lot safer since Roe, as maternal deaths declined despite large increases in the number of abortions. 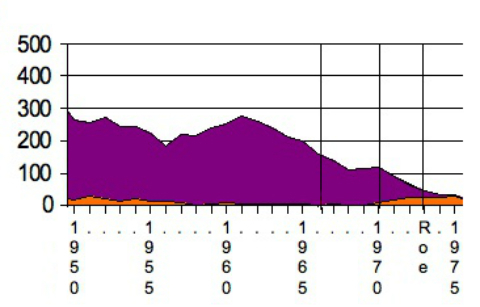 That said, I agree that antibiotics and transfusions were also major factors. 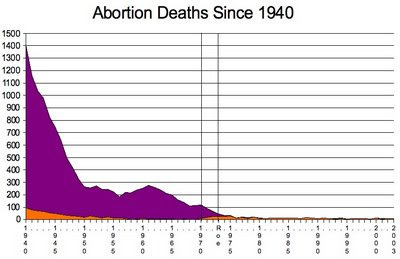 But they did not get safer post-Roe any faster than they were getting safer pre-Roe, so it's illogical to credit legalization for any of the drop. And think of it -- what motive did legalization give any criminal abortionist to stop? Even if he wasn't a doctor, the penalty if he gets caught is significanly lower. So what's his motive to quit? I agree that it would be a guess as to whether the odds of any given woman surving an abortion went up or down with legalization. Was the goal of legalization to reduce the risk to individual women or to reduce the overall number of women dying? The goal of legalization was to keep pregnant women and doctors from going to prison for seeking or performing abortions. Further, while it is logically possible that legal abortion would mean so many abortions that maternal death totals would be higher than under illegal abortion, this is extremely unlikely, and not even relevant given that abortions, except in the 3rd trimester, are safer than childbirth. I respect your position in opposition to abortion, and you have a good point about antibiotics and other medical improvements being a big part of the false narrative that legal abortion has saved many women's lives. But it isn't all of it either. "The goal of legalization was to keep pregnant women and doctors from going to prison for seeking or performing abortions." I agree that from the standpoint of the activists and organizations, that was the goal. I think a lot of the general public was just more concerned about women dying. And the organizations, I think, knew that as well. That's why they inflated the mortality numbers. 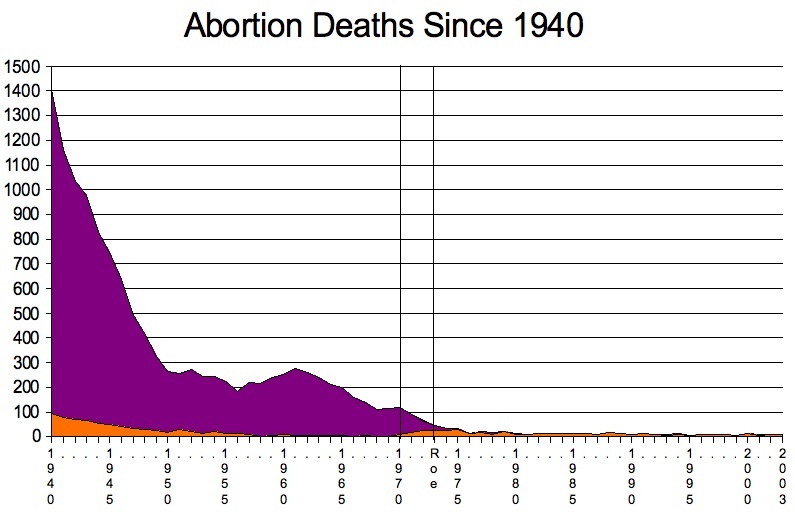 "Further, while it is logically possible that legal abortion would mean so many abortions that maternal death totals would be higher than under illegal abortion, this is extremely unlikely, and not even relevant given that abortions, except in the 3rd trimester, are safer than childbirth." I don't think that legalization did squat for the death rate either way. I think that for every unlicensed doctor that couldn't get business any more because ostensibly licensed clinics had opened, there was somebody like Jesse Ketchum or Milan Vuitch who got sloppy after legalization, or somebody who knew his limitations well enough to stay away from illegal abortions lest he go to prison, but who took up his curette after legalization took that fear away. I think we just swapped out one kind of quack for another. The presumption that abortion is safer than childbirth is another topic entirely. You can go to one of those threads if you want to take up that discussion. I'm glad that you're here and that we're having this discussion.